This extends the (MES) on the plant floor with wireless functionality for the capture of real-time transactions. If you are doing a physical inventory, moving material, looking up serialized part information, or any shipping tasks, the Handheld offers an easy to use interface that is designed for plant employees and helps them be more efficient. PTS offers a variety of Epicor® handheld customizations based on client needs. The bulk of this work involves customization of the screen layout for a handheld application so you can operate successfully in new environments or optimize your use cases. Improvements you may need could include custom overlays and interface changes for the handheld module, support for integration of data with Epicor® Vantage’s ability to auto-update and populate content, as well as disruptions caused by your handheld UI. PTS experts can help you with each aspect of Epicor® 9 and 10 handheld customization with tools that work across both systems in case your facilities are migrating in waves but you’d like to share data and generate reports that span your entire operation. Epicor® offers a variety of warehouse management solutions as part of its ERP packaging, as a standalone or in other software groupings such as Prophet 21. Handheld functionality for receiving, picking, adjustments, cycle counting and more are becoming commonplace in any environment. Our efforts are designed to maximize these common touchpoints and build you a single-core technology to rely on for all of your needs, whether you’re running a full-scale manufacturing operation or a small repair shop that needs to focus on inventory levels and project length estimates based on shippers, carriers, and available stock. Handhelds are your first line of defense in securing the right information, verifying orders at intake and properly forecasting the month ahead. We’ll put together the custom dashboard and handheld intake options that give you exactly what you need without all of the clutter that’s not relevant to you or your business. With the update, new functionality and customization needs have arrived for handhelds. 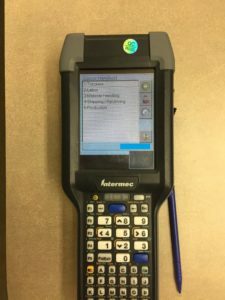 This can include barcode readers that run with additional parameters, support for moving between Production Management and Material Management menu options, as well as adjustments to your dashboards to support the new handheld functionality. The focus on C# has created some breaks in client architecture and reporting tools, but at PTS we’ve been able to manage this disconnect and properly repair systems so that functionality is restored and you can get the most out of your devices and dashboards. Epicor® 9 handheld devices may also experience some concerns when you update your system, so PTS has a step-by-step process to review functionality for errors and disconnects. We know your previous third-party options don’t often survive the migration or upgrade process, so let our expert engineers discover the fastest solution to your problems and provide you with a build that does its best to future-proof your mission critical tasks and reports. You've made a good choice!